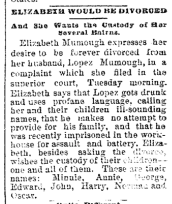 And she wants custody of her several [illegible] Elizabeth Mumaugh expresses her desire to be forever divorced from her husband, Lopez Mumaugh, in a complaint which she filed in the superior court, Tuesday morning. Elizabeth says that Lopez gets drunk and uses profane language, calling her and their children ill-sounding names, that he makes no attempt to provide for his family, and that he was recently imprisoned in the workhouse for assault and battery. Elizabeth, besides asking for the divorce, wishes the custody of their children—one and all of them. These are their names: Minnie, Annie, George, Edward, John, Harry, Norman and Oscar.